This review is way overdue. Sometime around 1996 I traded for a Para-Ordnance model P14-45 1911 style pistol. I wanted a full size 1911-A1 and I had heard that Para-Ordnance made quality pistols. What a joke that was!! First of all, the pistol printed about 5″-6″ high. You had to aim at the bottom of the page on a standard pistol target to hit anywhere near the bull’s-eye. Secondly, the pistol had two feed failures with 230 gr. FMJ ammo. When I purchased the pistol, I admired the three-dot combat sights. Shortly after, the dot on the front sight fell out. It appeared to be a dried chunk of enamel. When I inquired about selling or trading the pistol, a gun dealer pointed out the amount of “slop” or looseness in the overall fit of the pistol. 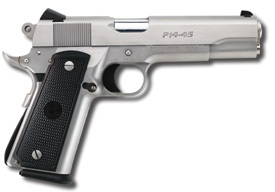 I remember reading a review in Handguns magazine where Jan Libourel praised the P-14. Even after he also noted that it printed about 4″-5″ high. If someone is going to pay $600+ (I think that’s what they cost in those days) it should shoot where it points! I’ve owned SIGs, HK, Glock , CZ, and countless S&W revolvers. Para-Ordnance doesn’t compare to any of them.